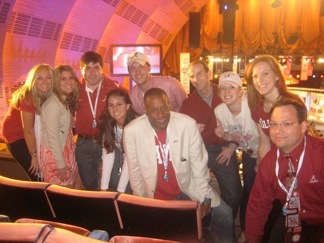 UANYC members had the great honor of being invited to the second and third rounds of the 2010 NFL Draft April 23 and 24 at Radio City Music Hall. Chapter members experienced an exciting evening as they witnessed three Alabama players get drafted -- Javier Arenas, Terrence Cody and Mike Johnson. "The experience was memorable. As always, it's great to participate in events with fellow alumni. It truly feels like being a part of a family," said Robbie Pruthi, a 2005 University graduate.